Friday, shortly after I got home from work, we had a heavy thunderstorm roll through. I was outside putting the windows on the Jeep when there was a flash and a tremendous boom. The back door was open because, with the very audible rumblings, I knew neither one would come outside. I jammed the window on, slammed the doors and dashed into the house. Neither cat was anywhere to be found. I have no idea where they went to hide but it was good. The rain came right after that flash was a heavy rain,a rain that sloshed all sorts of stuff out of the gutters and onto the deck and front steps, a rain that washed the road dust off the Jeep and made the sidewalks steam. 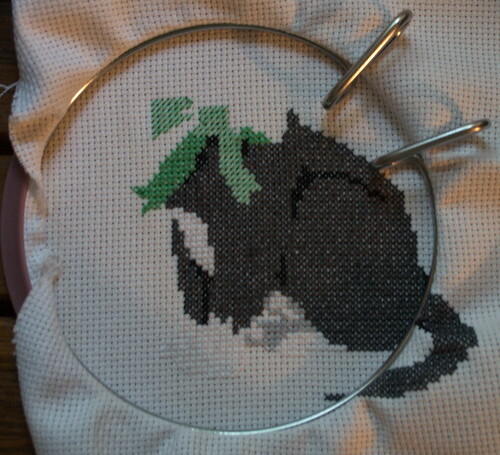 It was the perfect rain to stitch by. Eventually, Mija appeared and cuddled up next to me. When there were some very bright flashes of lightning, I would put my hand over her body and tell her it was okay. I could feel her freeze and start shaking with some of the more potent claps of thunder. Pilchard, eventually appeared. She came up into my lap and I tried to comfort her, holding her close, through a couple of explosions. Unfortunately, cats do not like to be held tightly and trying to comfort her by talking quietly while holding her close probably isn't getting the message across that it's okay and you're safe. I wish there was something I could do for her because she is very scared of storms. Perhaps it's just going to take years for her to understand that, when I'm here, she can come be by me. Perhaps she'll never understand. She finally went to the basement to hide. Doing dishes is the best time to also cross-stitch. I have to let the dishes soak for a period of time anyway, particularly pots and pan, so why not do more sections of the project as I wait. It was a productive couple of hours yesterday. 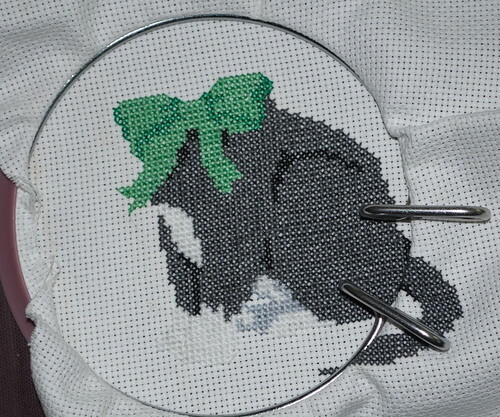 That is a green bow around the cat's neck. I think the next step is to go back to the tail area and finish the white tip and some minor shading where the tail meets the body. Then, I can work on the head. I also think I know to whom I'm giving this as a Christmas present. That makes me miss cross stitching. I haven't touched any in ages. Someday I'll make time again.